PCD cutting tool blanksare compound super-hard material of polycrystalline dismond lsyers and WC sintered under ultrahigh pressure and high temperature. It has the hardness and wear resistance of natural diamond and toughness of hard alloy. The surface of tools and processing work pieces made of such materials is highly polished and gringding processing operation is not required. Cutters have a long lifetime and high efficiency. It is an ideal and new-type tool material and can be widely applied in processing nonferrous metals and its alloy and non-metallic materials. Polycrystalline Diamond Compact(PDC), is manufactured with a diamond layer attached to a carbide substrate. Combining the properties of both super hardness and abrasion resistance of diamond with outstanding strength and toughness of of tungsten carbide, PDC has been widely used in mechanical industry, oil well drilling, geological prospecting drilling and coal mining. Note:The products can be manufactured per customer request as non-standard shapes such as rectangular, square, triangle, rhombus, sector and so on. They have high hardness, abrasion resistance and impact resistance, and widely used for oil/gas drill bit, rock drill and coal mining drill bit, also can be used for diamond tools for cutting, grinding, polishing. 8.The tool life of a PCD cutting edge is usually 50 to 250 times greater than that obtained with conventional tungsten carbide cutting tools. Suitable for Laser cutting and EDM. The products are available in 5μm,10μm and 25μm. 5μm is used for superfinish. 10μm is used to finish machining. 25μm is used to rough finish. Application: Aluminum,Copper,Precious metals,Wood Composites and Plastic. 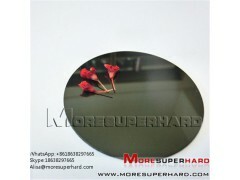 The advantage is excellent surface finish. Application: <14% Si/ Al Alloys,copper Alloys,Graphite and Graphite Composites,Wood Composites,Green ceramics and carbides. The advantage is excellent wear resistance and good surface finish. Application: >14% Si/ Al Alloys,metal Matrix Composites, Bi-metals (aluminum/ cast iron),Sintered Ceramics and Carbides,Other highly abrasives materials. The advantage is long life and extremely high wear resistance. PCD blank for PCD turning tools, PCD boring tools, PCD reamers, PCD milling tools. The PCD blank is used in many different fields including aviation, the car industry, electronics, and the wood and stone industry. It applies to various materials such as nonferrous metal, tungsten carbide, ceramic, nonmetal and composite material. PCD blank seleced according to your requirements .